Whether in a larger organization or as an independent consultant, many technology service and support professionals find themselves performing a wide variety of tasks relating to their work. This document explores four general areas of specialty within the profession of technology service and support. The musician in a band who loves to perform at live events and record in the studio, will soon discover that the music business also requires bookkeeping skills, marketing talent, customer service experience, and a variety of other supporting responsibilities. The musician wants to just focus on playing music, and let someone else run the business side of things. Those who struggle with creative talents may do very well with the organizational skills required to run a business, and visa versa. These characteristics are often referred to as people having right brain or left brain dominance. This is why musicians often have managers. These two activities run somewhat in parallel and require that one be in a different state of mind. Creativity is sometimes fostered by external factors such as being more relaxed and not being under deadlines. Maybe this is in the quiet hours late at night or early in the morning. During the day, maybe mid-morning or in the afternoon, you’ll find your mind is more analytical and sharp for administrative tasks, and you’ll spend some time on detailed and focused work. Or, for people who are always in one state of mind or the other, you’ll partner with someone who complements your skills and inclinations. The life of a technology professional is not that different from the life of an artist or musician. A creative mindset is required to develop solutions and improve workflows or procedures. The creative mindset appears to be easily distracted — taking in lots of information, brainstorming, and easily making new conceptual associations and revelations. For technology professionals, an organized, focused, and analytical mindset is also required — to aggregate data into meaningful and actionable conclusions that help attain desired outcomes. Sometimes a single individual can easily flow between creative/distracted and analytical/focused — adjusting their mindset to suit the current needs. Such people thrive with a diversity of demands placed on them. However, most people find it difficult to ‘change gears’ at will. If they are focused on something, a person interrupting them throws them off track and they may loose their train of thought. Or if they are trying to be creative, and then need to prepare a spreadsheet for a meeting presentation deadline, their creativity will be hindered by the stress and shift of mindset. This is why it’s common in businesses to have some creative people and also some business-minded people who collaborate periodically throughout the week, but mostly stay ‘in the zone’ by maintaining the mindset ideal for their work demands and responsibilities. Analytical. People who mostly find themselves in an analytical mindset will be well suited for the focused and lengthy step-by-step processes required for setting up hardware. They will also do well focusing on administrative tasks, documentation, inventory tracking, system testing, and researching hardware or software abnormalities. Improving workflows and procedures would be another area that is well suited for the analytical and focused mind. Creative. Those needing to come up with innovative solutions may benefit from having a creative disposition. While some disciplined research is needed, one needs a creative mindset to think of new approaches and solutions. At one level, this may involve meeting with people to assess their needs (consulting), and asking the right questions that will help result in innovations that meet goals. Implementation, oversight, improvement, engagement — these will all require a creative mindset to think through every aspect of a project or initiative. On a more granular level, those providing service desk support also need to be creative when confronted with undocumented user support problems and needs. Sometimes it’s enough to just send someone a link to the document that answers their question, but other times a creative mind is needed to solve problems and document the solutions. Scheduled. Those engaged in the creative task of consulting or the somewhat analytical task of administration will have in common the fact that much of their work can be scheduled, and scheduled meetings need not necessarily run long. In most meetings, time is allotted to address an issue, and people get as much done as they can in the allotted time. Then a meeting room needs to be vacated, and they need to go on to their next meeting. The creative consultant will meet with people, and discuss their needs, or set aside time in the schedule to work on special projects. There won’t likely be any interruptions in their day. On-Demand. People who provide desktop support for hardware or service desk support when people have usage questions may find that they are needed on-demand. Fixing problems may require unpredictable amounts of time. Other higher priority support needs may arise, causing other request to be reprioritized. Deadlines are more pressing as users are in need of equipment to get their jobs done. Such work demands can be more stressful. These two different work dynamics aren’t very compatible. In other words, it’s hard to be a help desk provider of immediate support, while at the same time attending meetings (and being on-time). The person who is 100% focused on the delivery of on-demand support can be much more responsive to people’s needs since they are essentially available at any moment (if the need is sufficient). For desktop support, those who are primarily setting up computers can work at their leisure, and setup computers when it suits someone’s schedule. Only when desktop support requires an immediate on-site support response does it require an interruption to one’s day. Based on the two common mindsets that people have (creative or analytical), and the two types of workload (scheduled or on-demand), we can easily organize four quadrants of technology service and support as shown below. Consulting (Creative/Scheduled). The consultant can schedule their week, going from one meeting to the next, with quite focused time set aside for creative solutions development and intentional collaboration. They will mostly rely on a creative mindset with a scheduled workload. Having a scheduled workweek creates windows of uninterrupted times for opening up the creative mind. Service Desk (Creative/On-Demand). The service desk professional needs to be creative and think fast for quickly getting through various support requests. This isn’t the first tier of help desk employees who just read from flowchart telephone scripts or send people links to documentation. This is the higher tier service desk professional who is coming up with the solutions and writing the documentation. They need to respond with innovation when needs arise. Administrative (Analytical/Scheduled). The higher calling of any director is to be a creative, inspiring, and motivational visionary who leads their organization toward a better workplace with greater outcomes. That role is one that’s largely creative. However, administrators are serving the larger community by organizing, implementing, overseeing, tracking, improving, testing, coordinating, and other tasks. Then they are tasked with aggregating data into meaningful actionable information. Although some ’emergencies’ arise, the administrator can mostly schedule their workload. Desktop Support (Analytical/On-Demand). Like the service desk professional, the desktop and hardware support person may be called on to respond quickly when hardware needs arise. When equipment fails, it needs to be repaired or replaced quickly. When a computer fails, in an enterprise environment, generally not much creativity is required to get it working again. It’s simply replaced with another system to minimize downtime. If creative solutions are explored, or research is conducted, that’s done after the person has been given a working computer. One doesn’t make the user wait while solutions are researched. So, for the most part, the desktop support person leverages an analytical mindset to methodically and patiently move through sometimes tedious work. It’s important to be detail oriented and focused. A creative mindset would be a detriment if it caused someone to overlook an important step or forget where they were at in a procedure. Click the chart below for a larger view. Consulting. The consultant will need experience and training in the areas they are advising on. They will need space in their office for meetings, or regular access to a space where they can meet with people. They may need some project management software and skills. It would help if such a person has had extensive experience in the service desk and desktop support areas so their advice is based on real-world experience. Service Desk. The ideal service desk solutions developer and creativist will be familiar with the full breadth of support calls that come in. They would be well equipped if they have experience as an entry level help desk employee. Administrative. The ideal administrator would have a good understanding of consulting, service desk, and desktop support areas. This way they can serve the team effectively from a place of experience and knowledge. Desktop Support. The desktop support person will need sufficient space for their work and equipment inventory inventory. The more space available for efficient inventory of equipment, the better they can serve the unit. 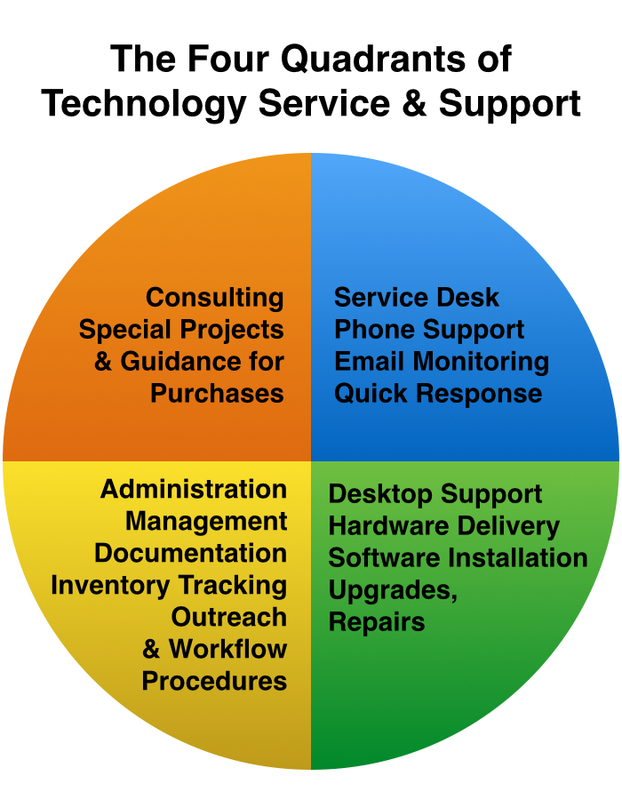 The service desk person need not have the array of physical hardware tools or experience that the desktop support person has. The desktop support person need not have the knowledge of software that the service desk person has. They will go to different meetings and rely on different support resources. However, if one person is trying to serve all these roles, their need for space and tools should be adjusted accordingly, and they would need to attend all the meetings required for the various roles. The consultant and administrator may be in more meetings, and would be unable to provide on-demand response to support needs. When small businesses grow to become larger businesses, it’s common for additional people to be hired, allowing categories of work to be assigned to specific people who can specialize in a certain area. The first ‘cell division’ would be to have two employees doing the work previously performed by one person. One of the employees could provide the help desk user support and desktop hardware support. The other employee could work on consulting and administration. This split works well because the mindset and logistics are similar, or at least easier to shift between. When a business grows to the point that they can have four employees, then it might make sense to use the four quadrant system for assigning tasks and responsibilities. Administrators and consultants can typically schedule their meetings during normal business hours. Desktop support professionals can usually work on setting up new computers, repairing existing computers, and retiring old computers during regular business hours. However, service desk people should be available after hours, or at least during the hours when support is anticipated. For example, with a college or university, meetings, lectures, and other work is typically done in the evening. So, providing support from 9 to 5 just doesn’t serve the real-world support the needs that exist. Although the four quadrants emphasize the different roles that technology professionals have, there is a need for collaboration and teamwork across these different specialties. This is important to make sure nothing falls between the cracks, and also helps ensure that each group is interfacing with the next group and handing off projects properly. There are a variety of services and technologies available for online collaboration. For example, Skype offers the ability to have video chat with a group, and also share your screen. Services like Zoom.us, Adobe Connect, BlackBoard Collaborate, and Microsoft Lync have additional tools useful for online conferencing and education. Most of these services perform fairly well with a fast computer and fast internet connection. Here are some suggestions for creating the best experience for an online session using audio and/or video with additional features like screen sharing and multi-user participation. Network Speed. Regardless of the service used, if the Internet speed is slow, the quality will suffer. With most Internet usage, we receive content (such as watching videos or listening to streaming music), but are not uploading content as frequently. With video conferencing, it’s important that your Internet upload speed (bandwidth) be sufficient. It may be necessary to purchase an Internet service package with more download speed than you feel you need in order to get enough upload speed. Usually, for a typical Internet service package, the upload speed is about 5% to 10% of the download speed. If you have a 50Mbps plan, the upload speed might be 5Mbps. Both people at each end of a one-to-one session will need to have this faster Internet service. With conferences that have many people remotely viewing, such video delivery (one to many) is usually handled by a server so you only need sufficient bandwidth for your own connection. Most services can work with slower connections, but the quality may suffer. The best way to check the quality of your connection is to run a test ahead of time. Headset. People sometimes use the speakers and built-in microphone on their computer for conferencing. This can result in poor audio. The computer can only do so much to alleviate feedback and background noise. So, the instructor / presenter and individual participants should definitely consider a headset. Or, in a one-to-one session both people should have a headset for the best audio quality. Group Microphone. For groups sharing a camera, getting the best quality microphone is essential. Having a separate high quality USB microphone can ensure that all participants are properly heard at the other end. Using a USB extension cable is important to ensure that the microphone can be placed in the best location. Camera Person. From the presenter / instructor perspective, looking at an entire group of people in a room and interacting with them sometimes isn’t that ideal. From a distance it’s hard to tell who is talking. Having a volunteer to work the camera helps. Or, alternatively, if people who are speaking can move forward closer to the camera. Multi-Camera. For larger groups, a multi-cam session might be helpful. This would require two computers be signed into the session simultaneously where the group is. In large auditoriums, sometimes there will be two microphones where people with questions can stand. This is where you’d want the web cams for a remote participant to see the questioners better. If there are breakout sessions at a conference, a remote participant or leader could engage with different groups. Fast Computer. While usually the Internet is the bottleneck for video communications, it can really help to have a fast computer. Quality Camera. Using a 720p or higher resolution webcam can be nice. Some systems may be constrained to using 4:3 image size and lower resolution video image anyway, but if the system supports it, the 16:9 viewing angle can get more people in the shot. If your Internet connection is fast enough, it’s possible to have 720p or higher resolution video. Independent Camera. Laptop computers, and some all-in-one desktops, have a video camera and microphone built-in. These usually work okay. However, separate components sometimes yield better quality results. Having a separate camera and microphone (rather than a single combined unit) can be nice because sometimes the optimal placement of the microphone will be different than the optimal placement of the camera. The camera may be set back a ways to show an entire group, but the microphone should be closer. Tech Support. Juggling the above variables requires experience and it’s often a good idea to have a technical support person available to help with setup. Preliminary Testing. It’s essential to test everything out ahead of time so you can make the adjustments needed for the best quality experience. This sometimes means buying additional equipment. 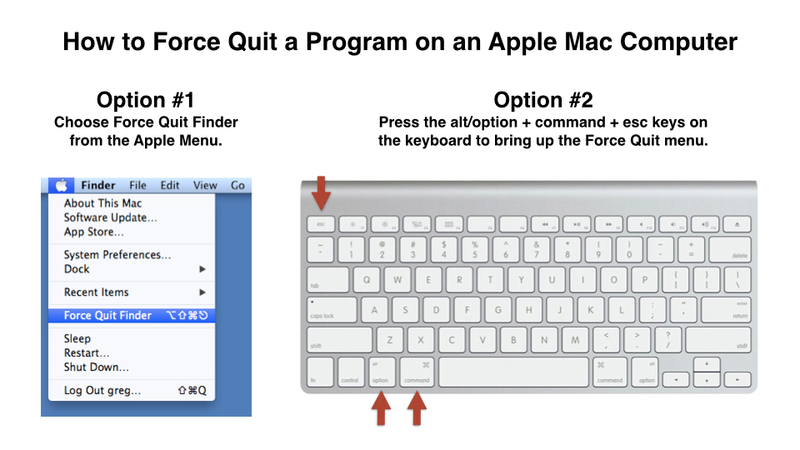 The chart below shows how to force quit a program on an Apple Mac computer. There are two primary ways to do this. You can choose Force Quit from the Apple Menu found in the upper left corner. Or, you can press the alt/option + command + esc keys on the keyboard to bring up the Force Quit menu. Click the image for a larger view. The Force Quit menu is shown below.